How ScreenCloud allowed this school to adopt digital signage, after 8 years of testing different systems. Merchant Taylors’ Schools is a family of schools based in Crosby, Liverpool including a primary school, Senior and Junior Boys’ School and Senior Girls’ School, for children aged 4 to 18 years. With a consistent 100% pass rate at A Level and 80% of all grades at A* to B, along with a focus on sports and extracurricular activity, Merchant Taylors’ is held in high-esteem within its area. Find a digital signage system suitable for schools that is cost effective, including the hardware. Implement a system that is easy to setup and manage and work with a digital signage vendor where feedback is listened and responded to. Find ways of sharing and curating content that isn’t labour-intensive on the staff and ICT department. Here we speak to Nigel Price, ICT Director, at Merchant Taylors' Schools on how he found ScreenCloud and how the school uses it today. As someone who has a background of working as CTO in a digital signage startup, I have extensive knowledge of digital signage software and the pros and cons of different systems within the industry. When I joined Merchant Taylors’ eight years ago I started looking at digital signage solutions that were suitable for schools and also cost effective. We experimented with many solutions but they were too costly especially from the player point of view and licensing costs. That's why when I stumbled across ScreenCloud I was so pleased as their solution was very easy to use and cost effective - even before the educational discount that they offer to schools - and their support is fantastic. Rather than expensive players and housing costs, our costs were the screens with Android player built in, or a screen we already had plus a tiny, cheap Amazon Fire TV Stick. With this solution up and running it’s now easier to ask for budget as once our English department had their screen, our other departments like Biology wanted one. At the moment they have a small screen running off a memory stick, which means they can’t update it instantly, or add Twitter screens like we can with ScreenCloud. For new installations within the schools we use screens from a company in the UK called AllSee which have an inbuilt Android Player, mounted in corridors in recessed areas. They’re great because the ScreenCloud player runs automatically on startup and we can schedule the screens to go off at night and turn on in the morning to save on power. Where we have existing TV screens we use them with Amazon Fire TV sticks. These are a great media player option due to low cost and the fact that the ScreenCloud app can be set to play automatically on startup. We have four different screens currently running across schools, all showing different forms of content. The ScreenCloud App Store has helped with content creation as the apps, particularly the Twitter, News, RSS and Facebook apps, mean that the content doesn’t have to be created in house. Once we’ve set up the schedule and playlist, the screens are fed by tweets and updates that are already happening elsewhere. We don’t have to reinvent content. For example, in the English department we have a screen which shows what’s happening within the department, mixed with general news from around the world which sparks debate and topic discussions in class. Our students stop to read the screens and the congestion in the corridors shows that they're taking note of what’s on there! The Head of Literacy then uses the screen to promote reading clubs, book clubs, literacy sessions and all sorts of things. 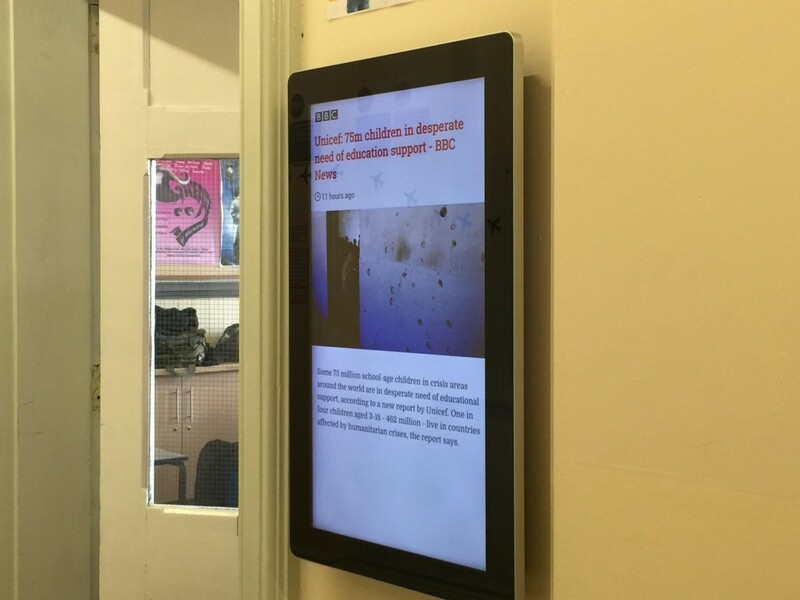 The screen at the Boys’ Sixth Form uses ScreenCloud apps to show current exchange rates, weather and news from the Financial Times, CNN and BBC. When the students are doing A Levels, real time events happening around the world are discussed in lessons and used to illustrate principles. We also show the Sixth Form Twitter feeds - for example if there’s a PSHE slot or morning briefing they will be told about it by the screens. Within the shared sports centre located at the Boys’ School we show general Twitter feeds about the school and the centre’s own Twitter feed which is used to promote the rental of the sports centre which does have an impact on our bottom line. If the sports centre is rented out, it’s paying for itself and its staff. Since implementing the system the only drawback has been more and more departments wanting to display messages so my team and I have to work harder! With school budgets, I found it very difficult to find a good, easy-to-use solution that was flexible enough and cheap enough for us to use, with buying players and so on. It’s taken me on-and-off, those eight years to really find a system which I liked enough, which was cost-effective enough. Until we found ScreenCloud we couldn’t adopt digital signage. I searched long and hard for a digital signage vendor that had a great solution, great support and pricing that was ok for schools and was easy to work with so I am really happy to recommend ScreenCloud. I deal with many vendors and Mark and his team have been very helpful and responsive to suggestions as well so they are a pleasure to work with. Interested in using ScreenCloud for your school, college or university? Sign up for our free trial at https://screen.cloud/signage​ - we offer 25% discount to all non-profit organizations.